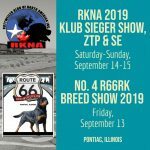 Membership Info › Rottweiler Klub of North America Inc. Membership becomes effective upon receiving a signed waiver and Executive Board approval. By joining the RKNA Inc. you agree to the member’s code of ethics and terms of the waiver. RKNA has partnered with an online membership platform called “MemberPlanet” this will allow you to access your own membership profile to update contact information and make renewal payments. 1) Under the JOIN US / Member Renewal tab for the direct online application. RKNA Inc. is always looking for members who would like to volunteer for committee positions or Board positions.